The IMAX release of Transformers: The Last Knight will be digitally re-mastered into the image and sound quality of An IMAX 3D Experience® with proprietary IMAX DMR® (Digital Re-mastering) technology. The crystal-clear images coupled with IMAX's customized theatre geometry and powerful digital audio create a unique environment that will make audiences feel as if they are in the movie. 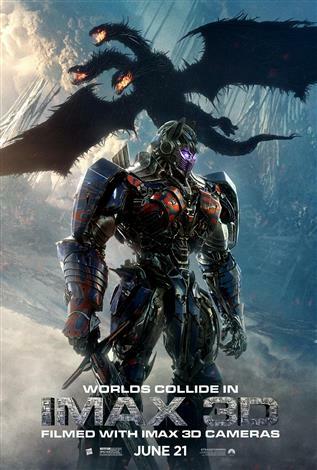 The Last Knight shatters the core myths of the Transformers franchise, and redefines what it means to be a hero. Humans and Transformers are at war, Optimus Prime is gone. The key to saving our future lies buried in the secrets of the past, in the hidden history of Transformers on Earth. Saving our world falls upon the shoulders of an unlikely alliance: Cade Yeager (Mark Wahlberg); Bumblebee; an English Lord (Sir Anthony Hopkins); and an Oxford Professor (Laura Haddock). There comes a moment in everyone's life when we are called upon to make a difference. In Transformers: The Last Knight, the hunted will become heroes. Heroes will become villains. Only one world will survive: theirs, or ours.